“Nudi” is short for nudibranch, a sea species known for it’s extraordinary colors and varying form and sizes. No wonder it’s one of the favorite macro subject of many underwater photographers. 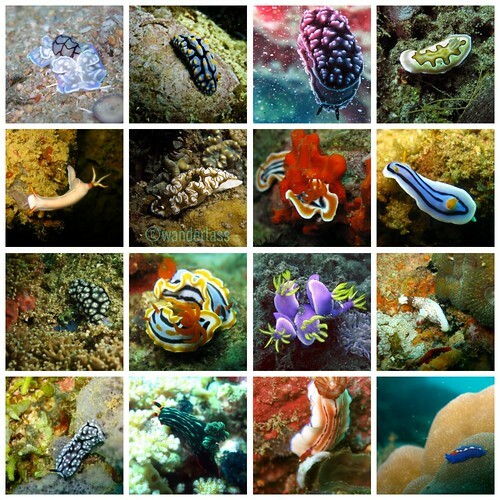 And NUDI is the name adapted by a group of avid diver-photographers in Metro Manila. Undoubtedly one myself, I took no time in becoming a member. NUDI cleverly stands for Network of Underwater Digital Imagers. The group was formed with the objective of providing a venue for avid diver-photographers to learn from each other. Once a month, we have a themed photo contest. Attendees are encouraged to bring their best photo for the theme, printed in 8″x10″ or 8″x12″ photo paper. Entries are then showcased gallery style during the night, and everyone in the house vote for their top 5. There are 2 contest categories based on the camera used: (1) DSLR and (2) Compact. But It’s not that serious. It’s really more of a merry get together to eat, drink, and talk about anything and everything scuba diving. It’s why we look forward to this monthly event. As NUDI got more members and willing sponsors, more activities are being planned and organized. We just had the first Photo Dive Workshop in Puerto Galera and it was great. It was a perfect way for me to get back to diving after 2 months of “dry spell”. Photo dive is like photo walk but diving. :) It was a 4 dive weekend with 2 each day. After dinner of day 1, we each submitted about 5 pictures to be presented in a slide show. Members are then encouraged to give comments, feedbacks, or ask questions. I was really looking forward to this part because some of the guys in this group are really good UW photographers. You see while I have been taking uw pictures for as long as I have been diving, I generally take photos for the purpose of record rather than art. Simply put, my photos are not great. Surely there are some people who think they”re okay–enough for them to fly in from the US to dive with me, but I don”t flatter myself, It’s really very amateur. I’ve always regarded my lack of professional quality underwater photos as my compact camera’s limitation. And I’ve refused to buy strobes because I don’t want to carry the extra weight and the fuss of caring for more gadgets. It’s capable of taking clear enough pictures and videos for my blog (and facebook), I’m happy with it. Now this all changed when I met some of the awesome photographers in NUDI, who uses compact cameras–exactly the same set-up as mine, no strobes, and their photos were f- fantastic! Professional LEVEL. So back to the photo dive workshop, it had been a great learning experience for me and I”m sure for everyone else. Special thanks goes to Jan Acosta who was so gracious for teaching me the use of my new camera-Canon S95 in Ikelite housing. I flooded my G9 late last year in Anilao and is still trying to figure out this new camera and housing. It will surely save me a lot dives with bad photos. Jules, Wowie, and Marie were also generous in sharing tips and tricks. I swear immediately the following day, my photos were better. The Inaugural NUDI Photo dive was hosted at GULI Diving in White Beach, Puerto Galera. GULI is a full service dive resort with excellent customer service. It’s a new shop so everything is shiny and new, including their tanks! Speaking of which, EAN (nitrox) here is the same rate as air. Our group took advantage of this great deal because we wanted to stay at the bottom for as long as we can. Gus and Lisa are the friendly owners ready to attend to requests. Dive masters and guides are trained to be excellent spotters. I highly recommend them, especially to those who love diving Puerto Galera but rather not stay in congested Sabang. If you”re a group of 8-12 people, you can request for a boat pick up at an alternate pier. It is 10x better than the crowded and chaotic Batangas Pier. Contact Gus to get a group rate for your next dive. hi! im a newly certified diver and came across your website, i love it! love all your pictures and stories. i never thought if needing an underwater camera until seeing all you photos. i just wana ask what other photography equip do you use aside from an s95 and ikelite housing to get such good pictures? what kind of lighting/strobes do u use as well? thanks! Canon actually should because I’ve already sold 4 + mine within 2011. You’ll be #6. :-) I know about 10bar housing for Lumix Lx3 @40K and suggested it to one of my friend thinking of getting into uw photography. My logic being, she knows the camera so well and already taking fantastic photos with it. To the more sensitive eyes, lumix photo does have more depth than that of canon’s. Except for the -50m and that it is serviceable (as oppose to being disposable), Canon made housing would be a LOT easier to work with. The buttons work better and easier to handle because it’s more compact.